Hooked on Needles: My First Quilt Along! I'm very excited! Remember over the summer when I spent most of my creative time working on projects to use up what I already had in my sewing room? The cozy crocheted tweed afghan, the purple and pink crocheted afghan, the granny square afghan, the I Spy quilts, my own design super cool Urban Chiks tote bag, and other items as well have brought me hours of stitching pleasure, useful items and much needed space reclaimed in my sewing room. This fun quilt along hosted by Moose on the Porch (love the name and logo!) calls for a layer cake and some yardage, or 12 fat quarters and some yardage. 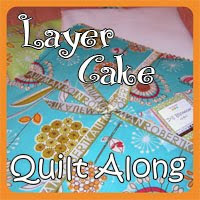 I don't have any layer cakes in my stash, but I sure have lots of fat quarters and I just know I can come up with enough yardage to cover those requirements too! The fun begins in two weeks, so I'm going to dig through my stash and see what else I can use up for this project. I'll show off my selections just as soon as I have them put together! In the meantime, I'm still working on a new Christmas pattern that I hope to have available shortly, and I have gifts for three different swaps to complete. Did I need another project hanging over my head? I think so! Oh how fun!! She has great projects! I just might have to check that one out too! !